Until recently, US machines were big, bulky, and expensive units with limited mobility. Modern US systems are comparatively small, portable, have improved imaging technology, and are more affordable, making this modality more accessible to all veterinarians. Despite the growing interest and utility of this diagnostic tool, little hands-on or experiential instruction on focused US is being provided to veterinary medical students at many institutions. Typically, veterinary students are exposed to POCUS primarily through club activities and elective courses/rotations. Concomitantly, current instruction to practicing veterinarians is being delivered through numerous and highly sought after continuing education courses by board-certified specialists throughout the country, suggesting that US is being used commonly in general practice. Thus, the purpose of this study was to assess the current practices and potential barriers to the use of US in general veterinary practice. The study's sample frame consisted of veterinarians who attended the North Carolina Veterinary Conference (NCVC), an annual continuing education meeting primarily serving general veterinary practitioners, in November 2015 and 2016. A list of 993 unique veterinarian attendees was identified. A census sampling approach was utilized, in which all 993 NCVC attendees were invited to participate in the study. A minimum of 224 respondents were sought to ensure a sampling margin-of-error within 5%. An electronic survey consisting of 12 items (7 items relating to US usage/training and 5 items relating to demographics) was administered in the fall of 2017 using (Qualtrics, Provo, UT, USA) immediately after mentioning the software. All responses were treated as anonymous. A complete list of survey items and their corresponding response options is available in the Appendix [Additional file 1]. Permission to conduct the study was approved by the University's Institutional Review Board. Data analysis consisted of calculating descriptive statistics (e.g., counts, percent, and correlations). The Statistical Package for the Social Sciences SPSS statistical software (IBM SPSS, version 24, Armonk, NY, USA) was used to perform the analysis. A total of 296 veterinarians completed the survey, resulting in a response rate of 29.8%. The sampling margin-of-error was 4.13%. Among respondents, 53% (n = 157) of practitioners reported having an US unit in their practice. Chi-squared test indicated that veterinarians who graduated after the year 2000 were more likely to have an US unit than those graduating before 2000, χ2 (8) = 15.591, P = 0.049). The majority of respondents reported using the US unit frequently, with 57% (n = 168) using US at least 4–5 times weekly, 23% (n = 68) using it 2–3 weekly, and 19% (n = 56) using it once weekly. Of the respondents with an US, 90% (n = 267) agreed or strongly agreed that US facilitated a more accurate diagnosis, whereas 10% (n = 29) disagreed or strongly disagreed. Concerning timeliness of diagnosis, the majority of the respondents with US (91%, n = 269) also agreed or strongly agreed that it facilitated a more timely diagnosis. Interestingly, the respondents who disagreed with US's utility to achieve a more accurate (χ2 = 18.61, P < 0.001) and timely (χ2 = 10.31, P = 0.016) diagnosis used their US less frequency. In fact, only three respondents who reported using US more than 5 times weekly disagreed with US's ability to facilitate a more accurate diagnosis compared to 67 respondents who agreed. Among respondents who did not have an US in their practices, the majority of veterinarians stated prohibitive cost (27%, n = 80) and lack of training (27%, n = 80) as the primary reasons. Other reasons for not having an US in their practices included it was not needed (5%, n = 15), would rather refer cases who need an US (14%, n = 41), and “other” reasons (29%, n = 86). Specific answers listed under “other” reasons included all of the above reasons, a combination of reasons listed above, have traveling sonographer visit the practice when needed, working in corporate practice, not sure the cost is worth the value to clients, not the practice owner, and not authorized to make purchasing decisions. Furthermore, 19% (n = 56) of the veterinarians who did not have an US responded that they would definitely or probably acquire an US unit within the next 5 years. The remaining veterinarians either responded that they were not sure (26%, n = 77), probably not (39%, n = 115), or definitively not (16%, n = 47) going to purchase an US unit within the next 5 years. Concerning the importance of POCUS training for new veterinary (Doctor of Veterinary Medicine [DVM] program) graduates, 42% (n = 125) of all veterinarians responded that training in POCUS was extremely important, 32% (n = 95) reported it was very important, and 18% (n = 54) reported it was moderately important. Only 7% (n = 21) reported it was slightly important and 1% (n = 2) reported it was not at all important. 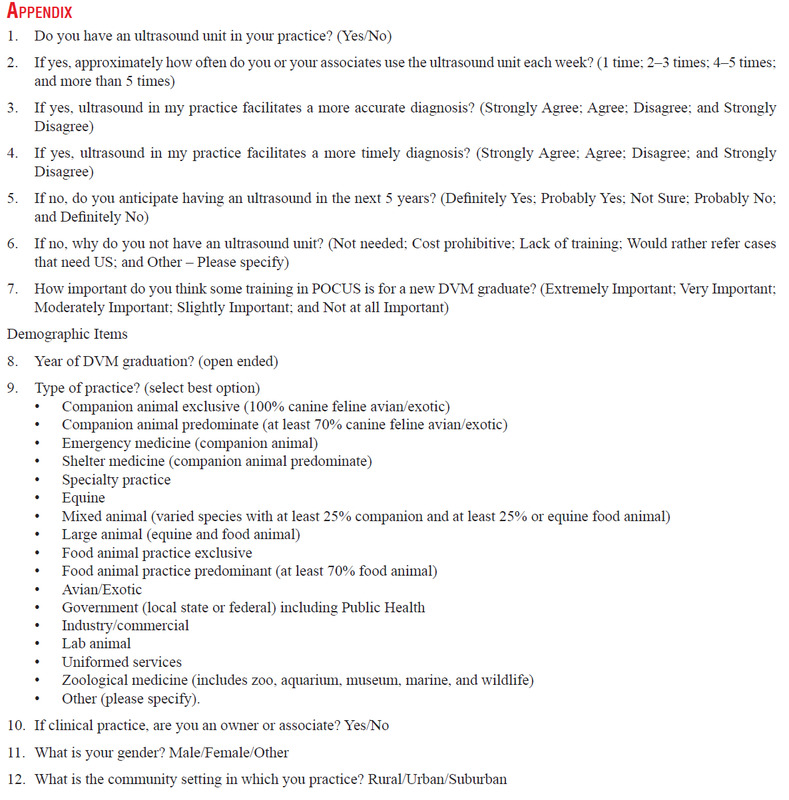 The results of the survey provide novel and important information regarding the current use of US by general veterinary practitioners in one geographic area of the United States. We found that over 50% of veterinarians in this survey reported having an US unit in their practice. Although the authors were unable to find historical data to compare, we believe this figure reflects the growing trend that US is becoming available across a variety of practitioners not only in human medicine but also in veterinary medicine. The increased accessibility is largely due to the transition of US units from large, expensive units to relatively lower priced, and compact size with good imaging capacity. The survey also revealed that nearly 20% of veterinarians who did not have an US unit are considering acquiring one within the next 5 years. The survey also identified the main reasons that veterinarians did not have an US in their practice. Prohibitive cost (27%) and lack of training (27%) were listed as the primary reasons but other reasons related to either the type of practice (such as shelter, house call, corporate practice, and hospice) or the option to refer to a specialist or have a mobile sonographer performs their US. The lack of training speaks to another important finding of this survey, which was that the majority, nearly 75% of the veterinarians surveyed, felt that some training in POCUS was extremely or very important for graduating veterinary students. We believe that the findings from this survey provide sufficient justification for expanding basic hands-on US training in veterinary medical education curricula as well as in continuing education experiences for practicing veterinarians. These educational experiences, both in veterinary schools and postgraduate wet labs, are primarily taught by board-certified specialists across the country. We believe that the focus of these educational experiences should be to teach high-yield US competencies presented as qualitative exams that are problem oriented (e.g., why is this patient in shock or having abdominal distention) and limited in scope. Findings from the survey also indicated that those veterinarians with an US unit in their practice reported using it relatively often. Among respondents with an US in their practice, 57% reported using it at least 4–5 times weekly and 43% reported using US 2–3 times weekly or less frequently. The majority of the veterinarians with US agreed that it facilitated a more accurate (90%) and timely (91%) diagnosis. Although we cannot verify whether or not the US actually facilitated improved patient care, the results of the survey suggest that the US at least improved the veterinarians' confidence in making a timely and accurate diagnosis. There are many studies in human medicine demonstrating improved patient care with POCUS.,, In veterinary medicine, most POCUS studies have evaluated dogs and cats presenting emergently with trauma or dyspnea.,, These emergency US studies showed that POCUS had comparable assessments of the patient's abdomen or chest for the presence of free fluid, free air, or underlying pulmonary pathology when compared to traditional diagnostic tests (comprehensive specialist US, radiographs, or review of medical record). A possible reason for why most of the veterinarians in this survey agreed with the statement that US facilitated a more accurate and timely diagnosis may be in part due to the notion that minimal sonographic training is required to successfully perform these basic emergency POCUS examinations.,, One study in veterinary medicine of noncardiology house officers showed that a 6-h-focused echocardiography training course improved knowledge and yielded acceptable proficiency in some echocardiographic findings (e.g., pleural effusion, pericardial effusion, and left atrial enlargement) commonly identified in the emergency room. The survey did, however, identify a minority of veterinarians in which an US in their practice did not reportedly facilitate a more accurate or timely diagnosis. This finding might suggest that US is a highly user-dependent modality and that in a minority of practitioners, a comfortable proficiency in image acquisition and interpretation can be difficult to achieve with minimal training. Most human studies have shown good short-term proficiency with minimal training,,,, but a recent study showed that this proficiency wains over time, especially if not used on a consistent basis. We did find a significant difference between a lower frequency of US use and the respondents who did not agree that US helped with formulating a diagnosis. More specifically, respondents who used the US three times or less per week were more likely to disagree that US facilitated a timely and accurate diagnosis. Although participants in this study are limited to veterinarians who attended a statewide veterinary conference, we believe that the results of this survey may be generalizable to many veterinary communities and general practitioners across the United States. Although there may be regional differences, the demographics of this survey's participants reasonably mirror both the recent American Veterinary Medical Association and US census statistics., More specifically, the majority of the respondents in this study were female (66%) and worked in exclusively or predominantly companion animal veterinarian practices (80%). These figures are comparable to the national statistics for veterinary practitioners in 2016, in which 59% were female and 75% worked in exclusively or predominantly companion animal practices. Furthermore, the communities served by this study's respondents were primarily suburban (60%) and urban (20%), which mirror 2010 US census data, indicating 83.7% of the population lives in “metroareas,” defined as a large city and its nearby suburbs. Despite the reasonable response rate, it is possible that the results of this survey may not accurately reflect the actual percentage of veterinarians and general practices having US capabilities in the geographic area. That is, although this study had a 4.13% sampling margin-of-error (a level of precision comparable to the most national public opinion polls), it is possible that response bias may be a concern. More specifically, it is possible that those veterinarians who are most passionate about US technology were more likely to respond to the survey. In an attempt to estimate the potential presence of response bias in this study, the lead author conducted informal polls at two recent small animal continuing education events in North Carolina and Virginia involving approximately 70 general practitioner veterinarians. The lead author asked with a show of hands how many veterinarians had an US in their practice and approximately 50%–60% raised their hands. Results of the informal polling converge with the findings from this study and offer some additional, albeit limited, assurance that the study's findings are representative of the sample's larger population. The results of this survey indicate that US is commonly used in general practices in at least one geographic area in the Southeastern United States. The majority of veterinarians with an US unit feel that it facilitates a more accurate and timely diagnosis. Prohibitive costs and lack of training are the most common reasons for not having an US. Most veterinarians feel that basic US training is an important skill for the modern veterinary medical students. These findings mirror the expansion of US practices in clinical human medicine. Kaplan DA. 2016. Available from: http://www.diagnosticimaging.com/ultrasound/portable-ultrasound-market-grows-machines-become- smaller-better/page/0/1. [Last accessed on 2017 Oct 05]. Elikashvili I, Tay ET, Tsung JW. The effect of point-of-care ultrasonography on emergency department length of stay and computed tomography utilization in children with suspected appendicitis. Acad Emerg Med 2014;21:163-70. Howard ZD, Noble VE, Marill KA, Sajed D, Rodrigues M, Bertuzzi B, et al. Bedside ultrasound maximizes patient satisfaction. J Emerg Med 2014;46:46-53. Hall MK, Taylor RA, Luty S, Allen IE, Moore CL. Impact of point-of-care ultrasonography on ED time to disposition for patients with nontraumatic shock. Am J Emerg Med 2016;34:1022-30. Grogan DR, Irwin RS, Channick R, Raptopoulos V, Curley FJ, Bartter T, et al. Complications associated with thoracentesis. A prospective, randomized study comparing three different methods. Arch Intern Med 1990;150:873-7. Hind D, Calvert N, McWilliams R, Davidson A, Paisley S, Beverley C, et al. Ultrasonic locating devices for central venous cannulation: Meta-analysis. BMJ 2003;327:361. Jones PW, Moyers JP, Rogers JT, Rodriguez RM, Lee YC, Light RW, et al. Ultrasound-guided thoracentesis: Is it a safer method? Chest 2003;123:418-23. Wigmore TJ, Smythe JF, Hacking MB, Raobaikady R, MacCallum NS. Effect of the implementation of NICE guidelines for ultrasound guidance on the complication rates associated with central venous catheter placement in patients presenting for routine surgery in a tertiary referral centre. Br J Anaesth 2007;99:662-5. Gordon CE, Feller-Kopman D, Balk EM, Smetana GW. Pneumothorax following thoracentesis: A systematic review and meta-analysis. Arch Intern Med 2010;170:332-9. Mehta N, Valesky WW, Guy A, Sinert R. Systematic review: Is real-time ultrasonic-guided central line placement by ED physicians more successful than the traditional landmark approach? Emerg Med J 2013;30:355-9. Johnson DW, Oren-Grinberg A. Perioperative point-of-care ultrasonography: The past and the future are in anesthesiologists' hands. Anesthesiology 2011;115:460-2. Mosier JM, Malo J, Stolz LA, Bloom JW, Reyes NA, Snyder LS, et al. Critical care ultrasound training: A survey of US fellowship directors. J Crit Care 2014;29:645-9. Vieira RL, Bachur R. Bedside ultrasound in pediatric practice. Pediatrics 2014;133:1-3. Hall JW, Holman H, Bornemann P, Barreto T, Henderson D, Bennett K, et al. Point of care ultrasound in family medicine residency programs: A CERA study. Fam Med 2015;47:706-11. American College of Emergency Physicians. Policy Statement: Definition of Clinical Ultrasonography. American College of Emergency Physicians; 2016. Available from: https://www.acep.org/Physician-Resources/Policies/Policy-statements/Imaging/Definition-of-Clinical-Ultrasonography/. [Last accessed on 2018 Oct 05]. Sabath BF, Singh G. Point-of-care ultrasonography as a training milestone for internal medicine residents: The time is now. J Community Hosp Intern Med Perspect 2016;6:33094. Whitson MR, Mayo PH. Ultrasonography in the emergency department. Crit Care 2016;20:227. Boysen SR, Rozanski EA, Tidwell AS, Holm JL, Shaw SP, Rush JE, et al. Evaluation of a focused assessment with sonography for trauma protocol to detect free abdominal fluid in dogs involved in motor vehicle accidents. J Am Vet Med Assoc 2004;225:1198-204. Lisciandro GR, Lagutchik MS, Mann KA, Voges AK, Fosgate GT, Tiller EG, et al. Evaluation of a thoracic focused assessment with sonography for trauma (TFAST) protocol to detect pneumothorax and concurrent thoracic injury in 145 traumatized dogs. J Vet Emerg Crit Care 2008;18:258-69. Ward JL, Lisciandro GR, Keene BW, Tou SP, DeFrancesco TC. Accuracy of point-of-care lung ultrasonography for the diagnosis of cardiogenic pulmonary edema in dogs and cats with acute dyspnea. J Am Vet Med Assoc 2017;250:666-75. Kobal SL, Trento L, Baharami S, Tolstrup K, Naqvi TZ, Cercek B, et al. Comparison of effectiveness of hand-carried ultrasound to bedside cardiovascular physical examination. Am J Cardiol 2005;96:1002-6. Mouratev G, Howe D, Hoppmann R, Poston MB, Reid R, Varnadoe J, et al. Teaching medical students ultrasound to measure liver size: Comparison with experienced clinicians using physical examination alone. Teach Learn Med 2013;25:84-8. Choi YJ, Jung JY, Kwon H. Effectiveness of education in point-of-care ultrasound-assisted physical examinations in an emergency department: A before-and-after study. Medicine (Baltimore) 2017;96:e7269. Tse YC, Rush JE, Cunningham SM, Bulmer BJ, Freeman LM, Rozanski EA, et al. Evaluation of a training course in focused echocardiography for noncardiology house officers. J Vet Emerg Crit Care (San Antonio) 2013;23:268-73. Kimura BJ, Sliman SM, Waalen J, Amundson SA, Shaw DJ. Retention of ultrasound skills and training in “Point-of-care” cardiac ultrasound. J Am Soc Echocardiogr 2016;29:992-7. AVMA Market Research Statistics: US Veterinarians; 2016. Available from: https://www.avma.org/KB/Resources/Statistics/Pages/Market-research-statistics-US-veterinarians.aspx. [Last accessed on 2018 Oct 14]. Cohen DT. Population Trends in Incorporated Places: 2000 to 2013. Population Estimates and Projections. U.S. Census Bureau. Available from: https://www.census.gov/content/dam/Census/library/publications/2015/demo/p25-1142.pdf. [Last accessed on 2018 Oct 14].